The Coca-Cola Company (KO) manufactures, distributes, and markets nonalcoholic beverage concentrates and syrups worldwide. The company is a member of the dividend aristocrat index and has increased distributions for 49 years in a row. The most recent dividend increase was in February, when the Board of Directors approved a 6.80 % increase to 47 cents/share. The major competitors of Coca-Cola include PepsiCo (PEP), Nestle (NSRGY), Unilever (UL) and Dr Pepper Snapple Group (DPS). 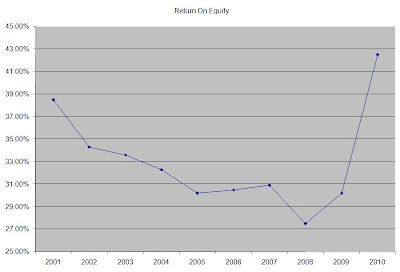 Over the past decade this dividend stock has delivered an annualized total return of 3.30% to its loyal shareholders. One of the largest shareholders in the company is Warren Buffett’s Berkshire Hathaway (BRK.B). The company has managed to deliver an impressive increase in EPS of 9% per year since 2001. 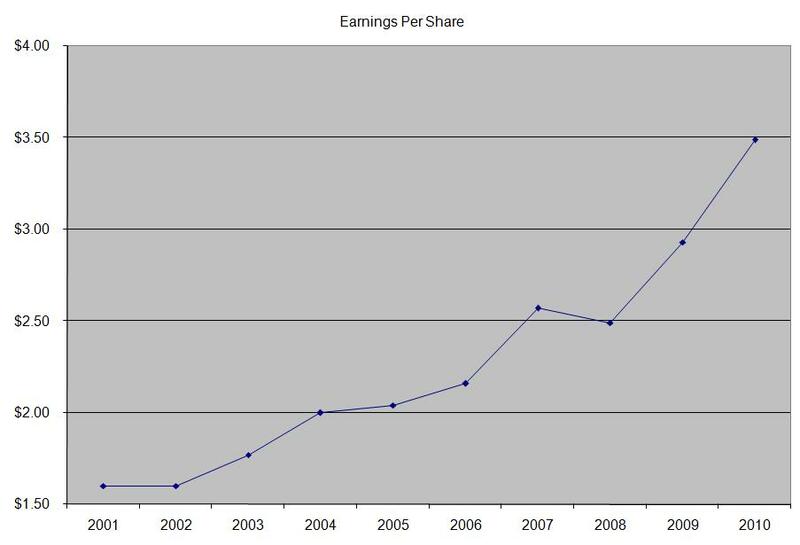 Analysts expect Coca Cola to earn $3.88 per share in 2011 and $4.27 per share in 2012. 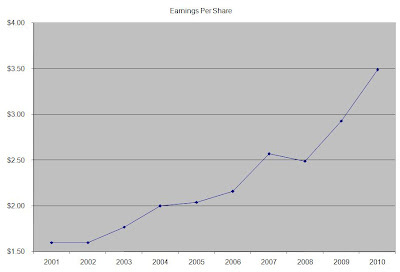 This would be a nice increase from the $3.49/share the company earned in 2010. Future drivers for earnings could be the company’s tea, coffee and water operations. Cost savings initiatives could also add to the bottom line over time, as well as increases in volumes in emerging markets such as China. Coca-Cola is targeting 3%-4% growth in annual revenue and 6%-8% growth in annual operating income. 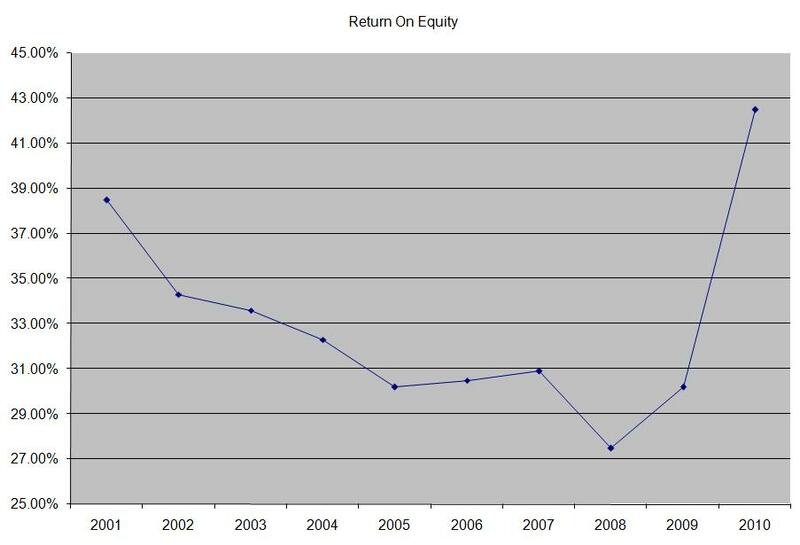 The company’s high return on equity has been on the rise since hitting a bottom at 27.50% in 2008. Rather than focus on absolute values for this indicator, I generally want to see at least a stable return on equity over time. The annual dividend payment has increased by 10.40% per year since 2001, which is higher than the growth in EPS. A 10% growth in distributions translates into the dividend payment doubling every 7 years. If we look at historical data, going as far back as 1967, we see that Coca Cola has actually managed to double its dividend every seven years on average. Over the past decade the dividend payout ratio has remained at or above 50% for a majority of the time. A lower payout is always a plus, since it leaves room for consistent dividend growth minimizing the impact of short-term fluctuations in earnings. Currently Coca Cola is trading at 18.40 times earnings, yields 2.90% and has a sustainable dividend payout. The stock meets my entry criteria, and I will look forward to adding to my existing position in it.